If your kids are like mine, they are always hungry. The request for a snack happens at least 2,435 times a day. I try to fill them up with healthy and protein-filled snacks like nuts to give them a little more oomph in their snack time. These honey roasted nuts are a great snack for kids and on the healthier side even with the added touch of sweetness. The kids love the crunch and sweetness of this roasted nut snack go perfectly with popcorn, making it a hit with kids and a great snack time treat. 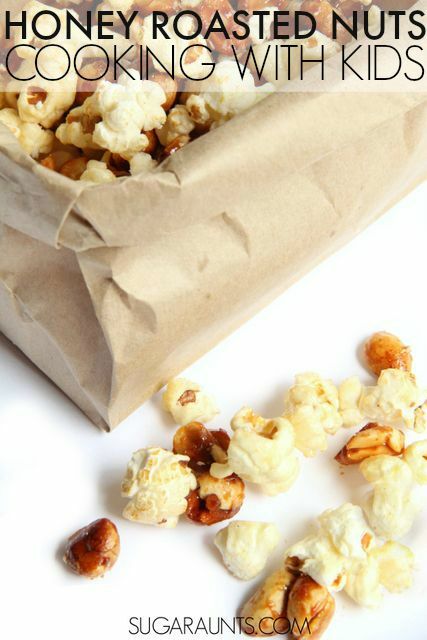 We made our honey roasted peanuts popcorn snack as part of the Cooking With Kids A-Z series and are now up to N for nuts! Follow our COOKING WITH KIDS pin board on Pinterest. 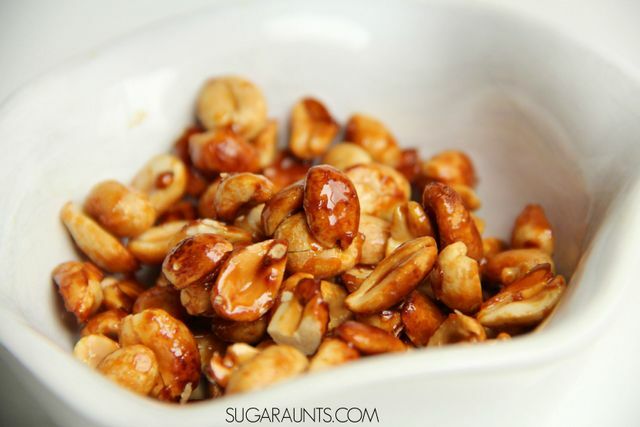 It is so easy to make honey roasted nuts. 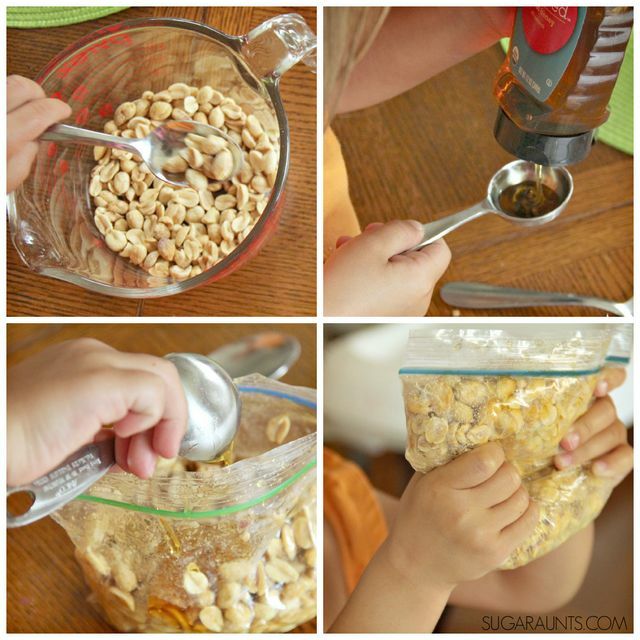 Simply scoop one cup of peanuts into a plastic baggie. Measure in 2 tablespoons of organic or local honey. Seal up the baggie start mixing the nuts and honey. Kids love this part of the recipe. Mixing the honey around is a great fine motor and sensory workout. Next, place a sheet of aluminum foil on a cookie sheet. Spread the honey-coated nuts out on the foil using a spatula . Place the peanuts into a pre-heated oven at 350 degrees Fahrenheit for 10 minutes. Be sure to keep an eye on the nuts as they roast and flip them with the spatula every 2 minutes. 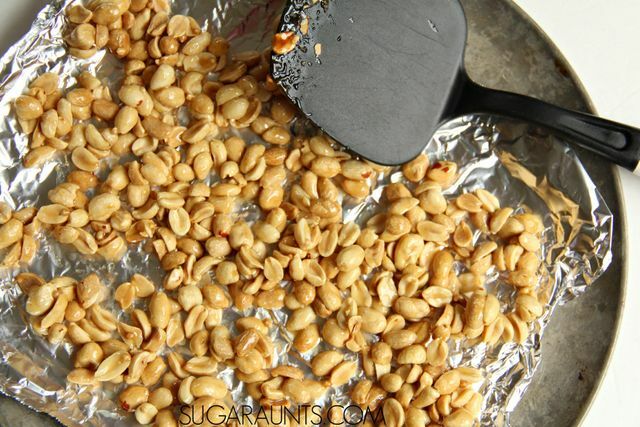 Pull the peanuts from the oven and allow to cool on the cookie sheet. Once hardened, break the peanuts up and serve in a bowl. 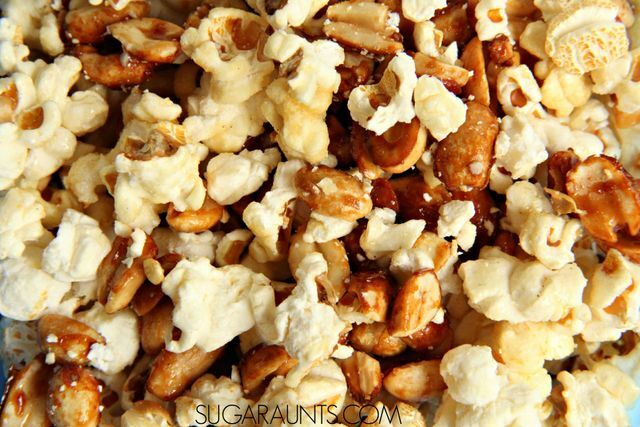 We decided to add our honey roasted peanuts to a bag of Kettle popcorn. 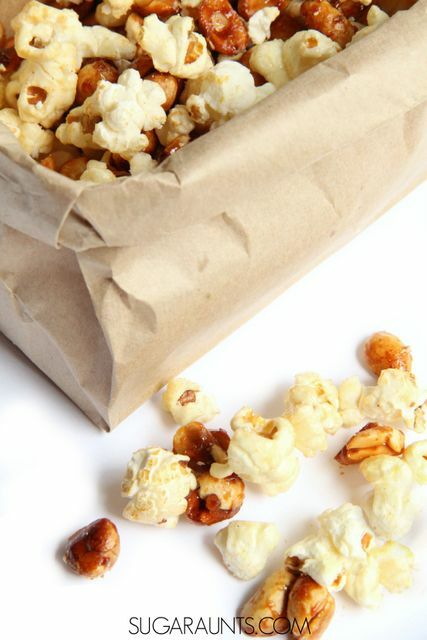 The sweet crunch of the peanuts goes so well with popcorn. 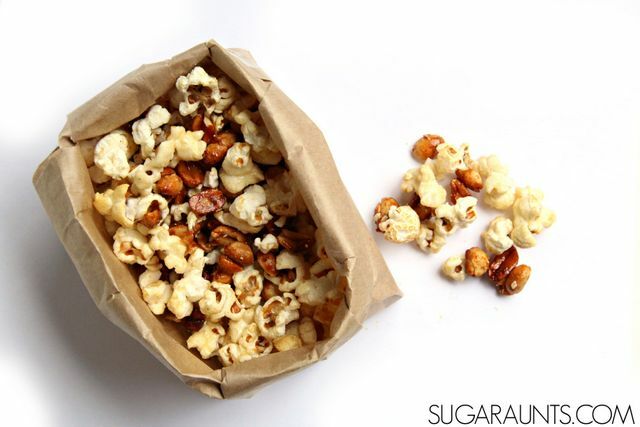 Serve the honey roasted peanuts and popcorn in a brown paper bag for a movie night treat. 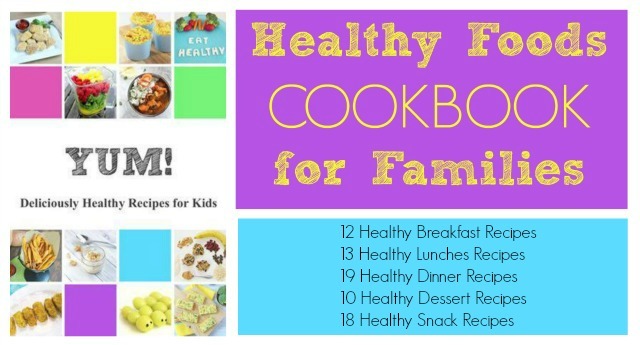 Follow our FOOD FOR KIDS pin board on Pinterest. 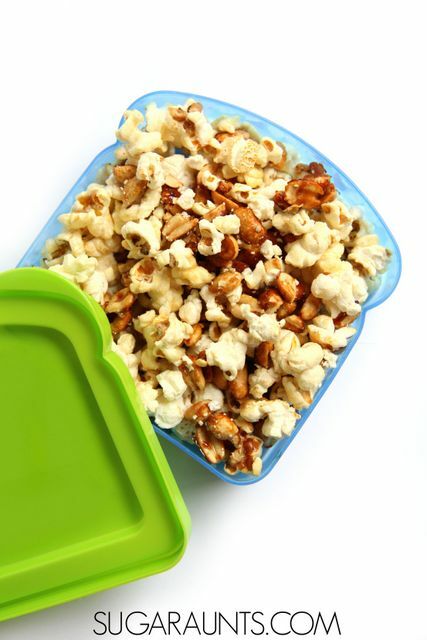 Add the peanuts and popcorn to your child's lunch in a sandwich container. Be sure to check on peanut allergy restrictions before sending this snack to school in a school lunch. This snack would be great for a picnic with books in the park before school starts, too! With this and any activity you find on our website, be sure to use your best judgement with your children. If there is a chance of a peanut allergy in your family, don't make this recipe. We recommend this cooking with kids recipe only if your children have exhibited no signs of peanut allergies in the past.